Clandestine London. Or what do you give the blog that has everything? You know your friends know you too well when your birthday card arrives with a list of 31 clandestine meeting places in London tucked inside it. And all of them seem to meet the Cafés That Are Not Franchises criteria of not being franchises. Clandestine London is a postcard-sized fold-out from Herb Lester Associates, which publishes guides “for tourists and locals: witty, pretty, curious and opinionated”. I could reel off a few of the highlights. But the Guardian has done that already. Suffice it to say I am tempted to book the Hotel Strand Continental for those nights when getting back to the wilds of Zone 2 seems like too much trouble. I’m also glad to see that Somerset House, on the Strand is on the list at number 30. 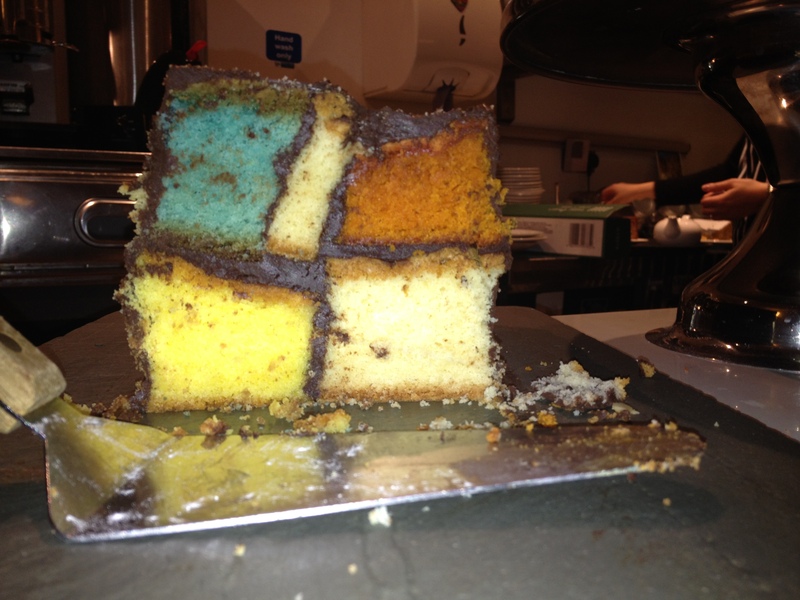 I’m not completely sure the art gallery cafe there is independent, but it does a rather amusing Mondrian Battenberg cake (as well as a good cream tea and other afternoon treats).